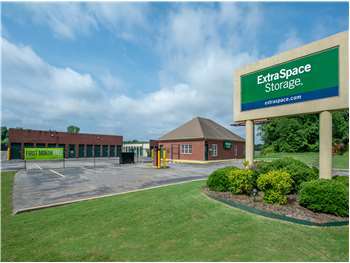 Located near the intersection of Martin Rd SW and Old Jim Williams Rd, Extra Space Storage serves residents of Huntsville, Madison, Redstone Arsenal, and more. Locals will recognize our facility across from Dollar General and Subway Restaurant a few minutes west from Ragland Cemetery. Looking for affordable self storage near Huntsville International Airport? Extra Space Storage is about 2.6 miles from the airport, providing residents and visitors with secure and easily accessible storage. Extra Space Storage is about 4.5 miles from Redstone Arsenal, so we're a convenient option for base personnel, active military, and military families who need secure storage units close to base. I would strongly recommend this storage place to anyone. It's nice clean very polite and excellent customer service. The best thing is quality, price there's no overages, and the communication. Yes I would use extra space storage again. Drive south on Sullivan St. Continue straight onto Wall Triana Hwy SW and pass I-565. Turn left onto Trademark Dr SW. Turn left onto Martin Rd SW. Our facility will be on the right. Drive north on Wall Triana Hwy SW. Pass Huntsville International Airport and turn right onto James Record Rd SW. Continue straight onto Martin Rd SW. Our facility will be on the right. Drive west on Martin Rd SW. Pass the Lake Forest subdivision and Huntsville Fire Station. Our facility will be on the left. Drive northeast on I-565. Pass Jetport Municipal Golf Course and take exit 9 toward Madison Blvd. Turn right onto Wall Triana Hwy SW. Turn left onto Trademark Dr. Turn left onto Martin RD SW. Our facility will be on your right.